We're no strangers to Sphero, having reviewed a few incarnations of the app-controlled robotic ball. However, as fun as it is, we'd hardly call a face-less ball that rumbles around your house cute... until now. Welcoming a new addition to the TP household, we check out the Sphero Star WarsBB-9E. You've seen the new Star Wars films, right? If not, you'll be surprised to know that, since the original trilogy, droids have changed. We were first introduced to BB-8 in The Force Awakens; an R2D2-like robot with a ball for a body. He epitomises cuteness, rolling around as he does. After seeing that, it probably wasn't a huge leap of the imagination for the designers at Sphero to say 'hey, lets stick a head on our popular ball robot and buy the Star Wars license. Which they did, when they released the Sphero BB-8 back in 2015. 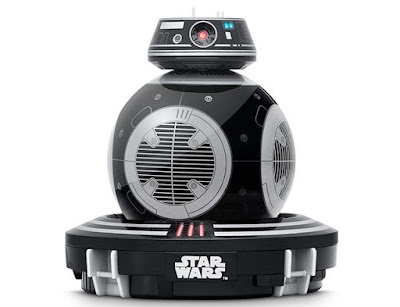 BB-9E is essentially the same product, although aesthetically slightly different, being modelled on the 'evil' First Order droid from The Last Jedi. He's black, has a flatter-shaped head, but is basically the same inside. And a tonne of bloody good fun. 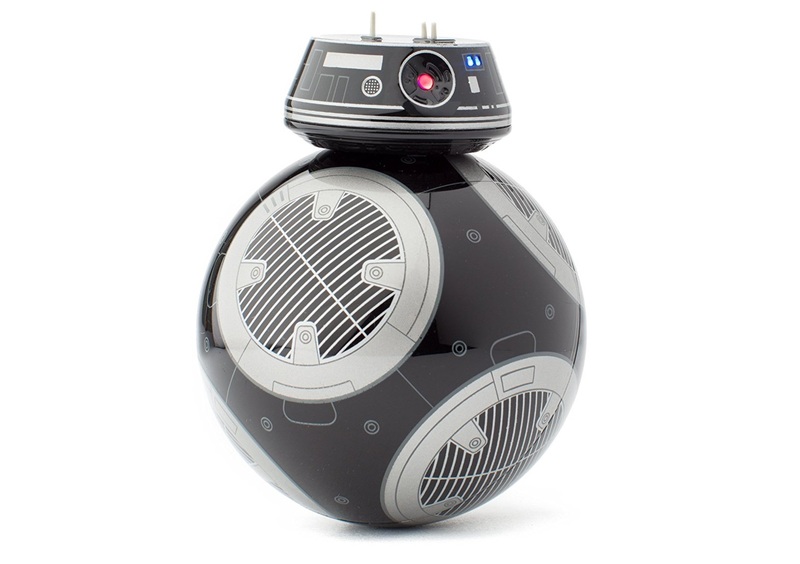 Download the Droids by Sphero app, link to BB-9E via Bluetooth, and you're ready to go. As with all Sphero products, you can freely drive him around using simply your finger on the screen of your phone. As with the 'real' thing, the head stays on top of the ball as it rolls... kinda. Get moving from a stand and the head may wobble and tilt weirdly, until you build up speed. Once the little chap is rolling, however, it looks very realistic, with the droid's head tilted forwards, face first, as if he is hurrying around by himself. 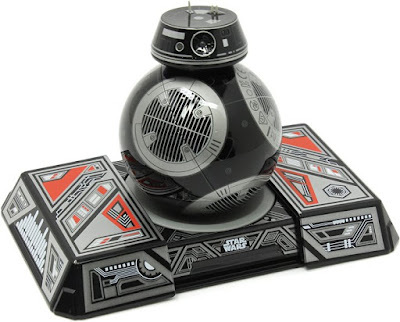 Speaking of autonomous movement, the Sphero Star Wars BB-9E robot is capable of driving himself around. You can change control mode to draw a desired path in the app, and he'll follow it, copying the movement. You can also tap simple reaction buttons, to make him act surprised, lost, peer around in wonder, or spin about like he's scared. Included in the box, as well as the inductive charging base that doubles as a nice stand, is the Droid Trainer. Working alongside the app in AR mode, this smooth recessed base allows the droid to frantically roll without moving anywhere, giving you an on-screen view of what it can 'see' as it explores the bridge of The Supremacy, the massive star destroyer featured in the film. You can interact with the environment and get a droid's-eye-view of a fairly well rendered model. 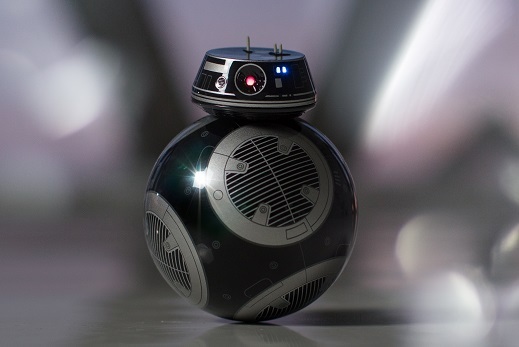 One feature we really enjoyed about Sphero's BB-9E was the watch-along ability. If you activate the droid while sitting down to watch a Star Wars film, it will watch it with you, reacting to certain scenes and moments as if fully sentient and enjoying it too. Granted, this is a slightly creepy feature, especially if you just use it to crash about the floor with your finger, but we really liked the reactions. There are bleeps and chirps during the action, and nervous warbles when something scary is happening. We tried it with The Force Awakens on Netflix and the timing of the droid was spot on. So although BB-9E can't do all that much more than a standard Sphero, adding the head and buddy features like the watch-along and AR point-of-view adds a lot more personality to the product. Our kids much preferred this to the original robot - even the cute Sphero Mini - and have spent long hours interacting with him, even long after his battery ran dry.